Humans who think we don’t understand them are the stupid ones. Hiro Arikawa is a masterful storyteller. I loved every word. I laughed, I cried, I was an emotional whirlwind in the best way possible. 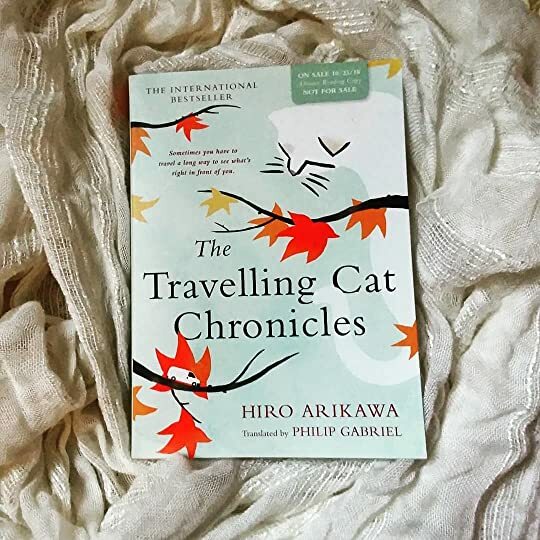 Satoru, a young businessman, attempts to befriend a young feral cat with a crooked tail. After a few weeks, the two work towards a mutual understanding – Satoru leaves “crunchies” for Nana and sometimes (only sometimes) Nana allows Satoru to pet him. Then, something awful happens – Nana is struck by a car. Somebody, help me! But that was idiotic. Nobody was going to help a stray. Then, I remembered the man who came every night to leave me crunchies. Maybe he could help. Satoru hears Nana’s painful yowls and rushes to help the injured cat. And thus begins one of the greatest human-feline friendships to have ever formed. Only, five years later, Satoru packs everything into his car (including Nana) and sets off to find Nana a new home. Bewildered but determined, Nana knows one thing is for certain – no one will keep him from his human. Wow – seriously wow – this book was good. I read it from cover to cover in a single afternoon and I’m itching for a re-read already! Humans always underestimate our language skills. Just cause they can read and write, there’s no need to act all high and mighty. I yawned back. Sorry. Zero interest. Noriko just didn’t get it. A wide box spoils all the fun; it offers none of the charms of being inside a box. really brought this book to life. I don’t know how to explain it other than Nana felt like a real cat to me. As Satoru attempts to find Nana a new home, he spends time with childhood friends. Inevitably, they begin to reminisce and the audience is treated with sweet and often hilarious flashbacks (often with sarcastic commentary, courtesy of Nana). I honestly don’t think this book could possibly be better. This is the kind of book that everyone should read at least once in their lifetime. Because it was a very special thing – to have your own cat in your home.